Kerds taking care of Biz. This is of course good news, but it's a little ominous to know that the forces that just defeated ISIS are currently on the losing end of a civil war. The Syrian Govt Forces will be coming for these guys soon. As well as the Turkish Government forces. If tRUmp just abandons them to be slaughtered it will be not only a huge betrayal it will also signify that American promises mean nothing to the rest of the world where we might need local help and support, and it will also once again play into Russian interests. US officials confirmed that “dozens” of US troops remain in the city, and have seen no sign of the Syrian forces trying to enter. Though the US is nominally aligned with the Kurds, the withdrawal is coming at the behest of, and in coordination with, Turkey. Turkey, naturally, is objecting to this new deployment, insisting that the Kurdish YPG have “no authority” to invite anyone else into Manbij, and claiming it was destabilizing the region. As Manbij is on the western shore of the Euphrates, Turkey has long ruled out allowing Kurds to remain there, though with most of the upcoming invasion targeting Kurds east of the river, this boundary means increasingly little. At any rate, it’s unlikely that the Kurdish YPG considered themselves to need any particular authority to request the help of Syria’s military to protect a Syrian city from foreign invasion. It’s also difficult to argue that resisting an invasion amounts to “destabilizing” anything. Syria’s Army similarly sent troops to the Afrin District to try to help them resist a Turkish invasion. This failed, though the district is immediately along the Turkish frontier, and far from Syrian supply lines, which limited their ability to support the defense. Manbij, by contrast, is a major city and right on major highways. Syria has a military presence not far south to call reinforcements, and after Russia warning Turkey against the invasion, may well be able to call in Russian support as well. The hope, at least for now, is that the presence of these troops will deter a Turkish invasion, as the presence of US troops in Manbij previously had. Turkish officials have been very public on their intention to invade, however, making it unlikely that they’ll not launch some sort of offensive against the area. I think we have found something on which we can agree. Yes I believe that the United States should do whatever it can to align with and provide for protection for the Kurds. They have been loyal to the rule of law and a fierce foe to our enemies. The United States needs to stand with them. theres gotta me something else. Tell me you hate the patriots too??? So it looks like the left and right are basically the same on war and intervention policies. You may believe what you like, but as a people with a conscious, I don't know how you can sit idly by and watch the slaughter of a group of people that have done nothing but support you at their own peril. Think whatever you want about the wars in Iraq and Afghanistan, but there is little doubt that the Kurd's were a loyal ally in those fights. They deserve support from the United States. They have been loyal allies, in everyone of our BS wars and in the M.E.. They've also been pawns of the U.S. imperial power struggles who we've left in the lurch on several previous occasions. After the 1st Iraq war we left them to deal with Saddam again. the U.S. gov't has off and on supported the Turks and other Groups that do not have the Kurds welfare in mind. The question isn't whether or not the Kurds are worthy of our support. They are. The question is whether or not we have the right to give it? Do we send troops and arms in to crave out a new nation for them between Iraq, Turkey and Syria? that's what they really need. Outside of that are still in the weeds. And long have been between many rocks and hard places. Giving them arms/supplies to defend themselves and poltica support is probably the most we can LEGALLY and Constitutionally DO. Unless we want to nation build... which is NOT our Job. And if so whose next? Yeman, is being beaten to crap by Sadui Arbia with our help? where's our moral U.S. military actions there. What about North Korea, the south Koreans have been great allies far longer than the kurds shouldn't we just clean up that northern mess? No. we are not the worlds police or mr. fix it. we don't even know HOW. Iraq is STILL a mess. Libya's a mess, Afghanistan is a mess, etc etc..
Nope. arms, supplies and advice, IF we can do it legally. nNot by pretending we can go into any country unannounced and do whatever the H377 we want just because we're AMERICA. We wouldn't stand for it if other nations did it to us here, or if some other nations did it others. 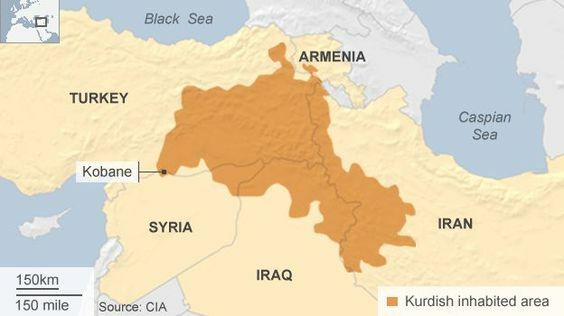 Last edited by mr wonder; 03-28-2019 at 06:04 PM..
"Kurds make up the Middle East's fourth-largest ethnic group, but they have never obtained statehood." I left out Iran and Armenia as part of the states the Kurds could crave out of. Israel got their nation peacefully, after WWI, via backroom deals at the U.N. and elsewhere. Be great if the Kurds could make that happen with our humanitarian and political help. they'd be OIL RICH as well. That's part of the reason for their troubles.